Jeff Bezos is the CEO and founder of Amazon which is currently the world’s largest E-Commerce website on the internet. Bezos is currently the third richest person in the world with a net worth of $72.8 Billions. In June 2017, Amazon bought Whole Foods Market Inc. which now makes him $2.8 billion richer and only $5 billion away from being the richest person in the world, Bill Gates. 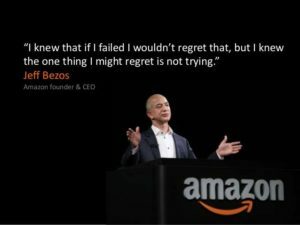 We hope that these Quotes from Jeff Bezos have given you some inspiration to achieve your goals today. Let us know what you think, which one is your favorite?